Mods are what happens when somebody takes a game, cracks it open and either adds or fixes stuff that wasn't in the final retail product. They're a big reason people play PC games, and we want to hear your favourites. For some games, mods are a fun way to tinker with the core title. Fix the user-interface, repair a few bugs, that sort of thing. For others, known as "total conversions", they can give a game a completely new lease of life, adding so much new content and changing so much of the original product that it feels like an all-new game. Since there are simply too many mods for too many games to go about making some kind of "best of" list, I figured I'd simply share some of my favourites, then throw open the floor to see what you guys like. This is as good as mods get. Nehrim builds an entirely new game out of the building blocks of Oblivion, with new voice acting, new characters and even a new lore. I loved Empire: Total War. 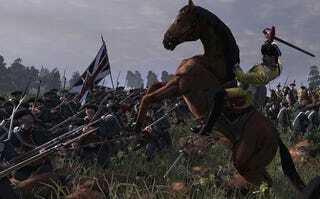 But I love Empire: Total War with DarthMod's tweaks a lot more. DM is what the actual Empire should have been, with better AI, more units on the screen and a wide range of other hugely-important tweaks made to the mechanics of the game. It's the galactic struggle that is Sins of a Solar Empire. Only, it's with Star Wars units. Meaning you're no longer some guy in a starfighter, or a lone jedi. You're the guy controlling the entire Empire or Rebellion, and you're doing it on the best 3D strategy engine since Homeworld (whose sequel had its own excellent Star Wars mod). And yes, I know, I didn't even bring up Fallout 3, Morrowind, Counter-Strike or any other number of mod favourites. That's what you're about to do! I've got one request, though: try and stick to mods that you can actually play. None of this "coming soon but looks awesome" stuff, OK?